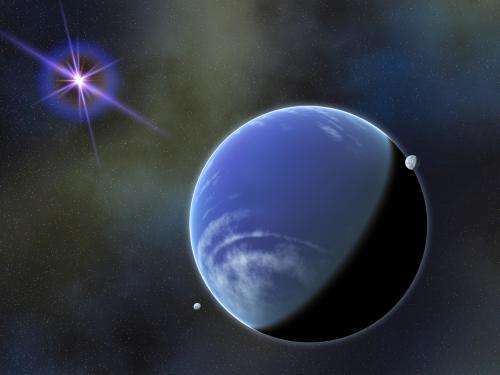 (PhysOrg.com) -- The photo of a nearby star and its orbiting companion -- whose temperature is like a hot summer day in Arizona -- will be presented by Penn State Associate Professor of Astronomy and Astrophysics Kevin Luhman during the Signposts of Planets conference at NASA's Goddard Space Flight Center on 20 October 2011. A paper describing the discovery will be published in the Astrophysical Journal. One of the worst "artist's impression" images that I have seen. A 5 minutes work of an amateur journalist. The illumination does not match a scenery like this in any way. The planet shadow is too sharp and it does not match the star perspective at all. Those "little white clouds" define poles that could never be in the same axis. The atmosphere is illuminated... in the night side!. One moon is too close, it would break appart at that distance. The background "fog" does not correspond to any kind of nebulae or imaginable gas cloud in space. And what is this weird star halo? a white dwarf corona? come on.. , and how is it possible such a lense flare when looking to a white dwarf at 2500AU. Not to mention that the image is really ugly, but at least it should be coherent as corresponding to a physics website. ...and to top it all off, it's not even brown! Not fair I'd say. Not even a real brown dwarf either, more like Webster. Maybe its a blue dwarf. I wonder why it's so sad ? brown dwarfs are going to the be the new black holes. theres tons of them out there and we have yet to develop the sensitivity to identify them. plus, if there is intelligent life out there , there's a good chance we will see it very close to a brown dwarf rather than a violent, far less stable, ordinary star of any other type. If the "planet" is actually a Brown Dwarf star, then it's probably nothing like Earth. Atmospheric temperature is one thing, but its atmospheric composition is equally as important. But, still, it's close enough to be studied in detail. Would not be habitable in all likelihood. Gaseous atmosphere would be so deep, like a king sized Jupiter as to be at pressures strong enough to extrude aluminum or stronger at its base. No place to take a vacation. Artist's concept may not be so far off...what do WE know about such places. None of US have been there so I would give the artist the benefit of the doubt.